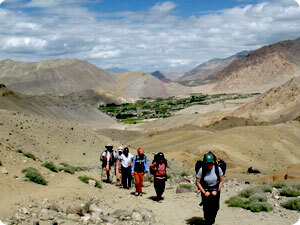 India trekking is one of the most famous adventure activities in India. The panoramic Himalayan ranges of India swear breathtaking and exciting trekking trips in India. The rugged beauty of these lofty mountains encourages travelers / Trekkers / Mountaineers or tourists from all over the world. A landscape of mild undulating meadow combined with many a brook and lakes snow capped peaks, rugged mountain trails and varied flora and fauna make trekking in India is the popular trekking destination. The Indian Himalaya has attracted geologists, geographers, Trekkers and lovers of nature as well as it has a strange fascination for artists, poets, photographers and mystics. Himalaya Journey Trekking Expedition, Nepal offer all kind of trekking tour in India including the Trekking in Ladakh, Trekking in Garhwal and Kumaon regions, Trekking Chamba, Manali trekking , trekking in Jammu & Kashmir , Ladakh trekking, Zanskar trekking, Trekking Lahaul-spiti, trekking in Kullu, Kangara trekking tour , trekking in Leh, Trekking in Manali, Trekking in Nubra valley, Trekking in Leh, trekking in Darjeeling, trekking in Yuksam trekking, sikkim sandakphu trekking, Sikkim gochela trekking as well more other interesting trekking routes in India. Since India trekking trail has been open Himalaya Journey Treks & Expedition ,Nepal has depth experience to operate the trekking in India with co-operate local trekking and travel agency of India. India is the land blessed with snow-bound peaks, crystal glaciers, rolling meadows, jagged rock faces, scenic valleys, meandering rivers, cascading waterfalls, dense forests and hospitable people with a rich culture. For those fascinated by the unexplored, the hills offer breath taking adventurous trekking routes. The Indian Himalayas have also been part of the all important silk route in the times gone by, a reminder of the hardiness of the human race. HJT professional generate trekking itinerary according to trekkers/Travelers /mountaineers desire for all over the India.